One person done it so far. Woop. Thanks I am a master at web art especially Fireworks MX. I've ALMOST finished the wordsearch... almost, lol. 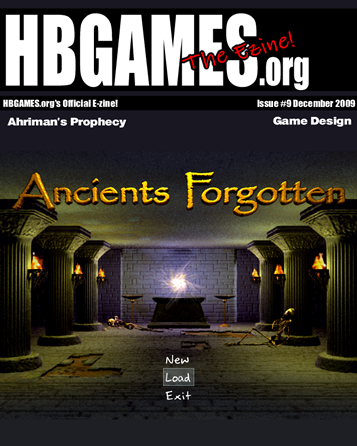 ...though it's pretty ironic that I've just released an updated version of the game a few days ago, Alchemy Arcanum, with a lot of the negative issues of Ancients Forgotten improved upon. Thanks a lot for the review though, ebhz. I'm glad you enjoyed it. Ok, this needs some work doing for the H4xx0r and Hallowe'en themes. Sorry about that, I did it for the old ezine style but not for the new larger one. Similar to what I did with issue 10, I've added an extra three pages to this and reshuffled some things. Was just embarrassed by how short it was to be honest, and how many forum events were missing that were going on at the time. Anyway, that's the last of the edits I'll make probably, it's just a little, well, longer now.